From KWLs to “foldables” and more, the Arizona Interactive Notebook: A Hands-On Approach to Learning About Our State! resource includes activities that will have students exploring their state's history, geography, people, government, economics, and symbols in a whole new way! 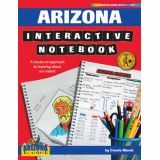 A true-time saver, the Arizona Interactive Notebook: A Hands-On Approach to Learning About Our State! includes ready-to-use pages and instructions that make state-studies fun and successful for the whole class. The Arizona Interactive Notebook: A Hands-On Approach to Learning About Our State! is more than just a notebook for taking notes—it's a way of collecting and thinking about information. The Arizona Interactive Notebook: A Hands-On Approach to Learning About Our State! helps students become creative, independent, and reflective thinkers, readers, and writers. Students learn to express their own ideas and apply skills learned in class. The Arizona Interactive Notebook: A Hands-On Approach to Learning About Our State! gives teachers ready-to-use pages, templates, instructions, writing prompts, and more, making it easy to start using their interactive notebooks today! From KWLs to “foldables” and more, the California Interactive Notebook: A Hands-On Approach to Learning About Our State! resource includes activities that will have students exploring their state's history, geography, people, government, economics, and symbols in a whole new way! A true-time saver, the California Interactive Notebook: A Hands-On Approach to Learning About Our State! includes ready-to-use pages and instructions that make state-studies fun and successful for the whole class. The California Interactive Notebook: A Hands-On Approach to Learning About Our State! is more than just a notebook for taking notes—it's a way of collecting and thinking about information. The California Interactive Notebook: A Hands-On Approach to Learning About Our State! helps students become creative, independent, and reflective thinkers, readers, and writers. Students learn to express their own ideas and apply skills learned in class. The California Interactive Notebook: A Hands-On Approach to Learning About Our State! gives teachers ready-to-use pages, templates, instructions, writing prompts, and more, making it easy to start using their interactive notebooks today! From KWLs to “foldables” and more, the Connecticut Interactive Notebook: A Hands-On Approach to Learning About Our State! resource includes activities that will have students exploring their state's history, geography, people, government, economics, and symbols in a whole new way! 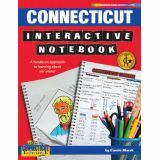 A true-time saver, the Connecticut Interactive Notebook: A Hands-On Approach to Learning About Our State! includes ready-to-use pages and instructions that make state-studies fun and successful for the whole class. The Connecticut Interactive Notebook: A Hands-On Approach to Learning About Our State! is more than just a notebook for taking notes—it's a way of collecting and thinking about information. The Connecticut Interactive Notebook: A Hands-On Approach to Learning About Our State! helps students become creative, independent, and reflective thinkers, readers, and writers. Students learn to express their own ideas and apply skills learned in class. The Connecticut Interactive Notebook: A Hands-On Approach to Learning About Our State! gives teachers ready-to-use pages, templates, instructions, writing prompts, and more, making it easy to start using their interactive notebooks today! From KWLs to “foldables” and more, the Deleware Interactive Notebook: A Hands-On Approach to Learning About Our State! resource includes activities that will have students exploring their state's history, geography, people, government, economics, and symbols in a whole new way! A true-time saver, the Deleware Interactive Notebook: A Hands-On Approach to Learning About Our State! includes ready-to-use pages and instructions that make state-studies fun and successful for the whole class. The Deleware Interactive Notebook: A Hands-On Approach to Learning About Our State! is more than just a notebook for taking notes—it's a way of collecting and thinking about information. The Deleware Interactive Notebook: A Hands-On Approach to Learning About Our State! helps students become creative, independent, and reflective thinkers, readers, and writers. Students learn to express their own ideas and apply skills learned in class. The Deleware Interactive Notebook: A Hands-On Approach to Learning About Our State! gives teachers ready-to-use pages, templates, instructions, writing prompts, and more, making it easy to start using their interactive notebooks today! From KWLs to “foldables” and more, the Florida Interactive Notebook: A Hands-On Approach to Learning About Our State! resource includes activities that will have students exploring their state's history, geography, people, government, economics, and symbols in a whole new way! A true-time saver, the Florida Interactive Notebook: A Hands-On Approach to Learning About Our State! includes ready-to-use pages and instructions that make state-studies fun and successful for the whole class. The Florida Interactive Notebook: A Hands-On Approach to Learning About Our State! is more than just a notebook for taking notes—it's a way of collecting and thinking about information. The Florida Interactive Notebook: A Hands-On Approach to Learning About Our State! helps students become creative, independent, and reflective thinkers, readers, and writers. Students learn to express their own ideas and apply skills learned in class. The Florida Interactive Notebook: A Hands-On Approach to Learning About Our State! gives teachers ready-to-use pages, templates, instructions, writing prompts, and more, making it easy to start using their interactive notebooks today! From KWLs to “foldables” and more, the Hawaii Interactive Notebook: A Hands-On Approach to Learning About Our State! resource includes activities that will have students exploring their state's history, geography, people, government, economics, and symbols in a whole new way! A true-time saver, the Hawaii Interactive Notebook: A Hands-On Approach to Learning About Our State! includes ready-to-use pages and instructions that make state-studies fun and successful for the whole class. The Hawaii Interactive Notebook: A Hands-On Approach to Learning About Our State! is more than just a notebook for taking notes—it's a way of collecting and thinking about information. The Hawaii Interactive Notebook: A Hands-On Approach to Learning About Our State! helps students become creative, independent, and reflective thinkers, readers, and writers. Students learn to express their own ideas and apply skills learned in class. The Hawaii Interactive Notebook: A Hands-On Approach to Learning About Our State! gives teachers ready-to-use pages, templates, instructions, writing prompts, and more, making it easy to start using their interactive notebooks today! From KWLs to “foldables” and more, the Idaho Interactive Notebook: A Hands-On Approach to Learning About Our State! resource includes activities that will have students exploring their state's history, geography, people, government, economics, and symbols in a whole new way! A true-time saver, the Idaho Interactive Notebook: A Hands-On Approach to Learning About Our State! includes ready-to-use pages and instructions that make state-studies fun and successful for the whole class. The Idaho Interactive Notebook: A Hands-On Approach to Learning About Our State! is more than just a notebook for taking notes—it's a way of collecting and thinking about information. The Idaho Interactive Notebook: A Hands-On Approach to Learning About Our State! helps students become creative, independent, and reflective thinkers, readers, and writers. Students learn to express their own ideas and apply skills learned in class. The Idaho Interactive Notebook: A Hands-On Approach to Learning About Our State! gives teachers ready-to-use pages, templates, instructions, writing prompts, and more, making it easy to start using their interactive notebooks today!